Saving for Retirement and a Child's Education at the Same Time | Integrated Wealth Strategies, Inc.
You want to retire comfortably when the time comes. You also want to help your child go to college. So how do you juggle the two? The truth is, saving for your retirement and your child's education at the same time can be a challenge. But take heart — you may be able to reach both goals if you make some smart choices now. Does your company offer an employer-sponsored retirement plan or a pension plan? Do you participate? If so, what's your balance? Can you estimate what your balance will be when you retire? What standard of living do you hope to have in retirement? For example, do you want to travel extensively, or will you be happy to stay in one place and live more simply? Do you or your spouse expect to work part-time in retirement? How many years until your child starts college? Will your child attend a public or private college? What's the expected cost? Do you have more than one child whom you'll be saving for? Does your child have any special academic, athletic, or artistic skills that could lead to a scholarship? Do you expect your child to qualify for financial aid? Many on-line calculators are available to help you predict your retirement income needs and your child's college funding needs. After you know what your financial needs are, the next step is to determine what you can afford to put aside each month. To do so, you'll need to prepare a detailed family budget that lists all of your income and expenses. Keep in mind, though, that the amount you can afford may change from time to time as your circumstances change. Once you've come up with a dollar amount, you'll need to decide how to divvy up your funds. Though college is certainly an important goal, you should probably focus on your retirement if you have limited funds. With generous corporate pensions mostly a thing of the past, the burden is primarily on you to fund your retirement. 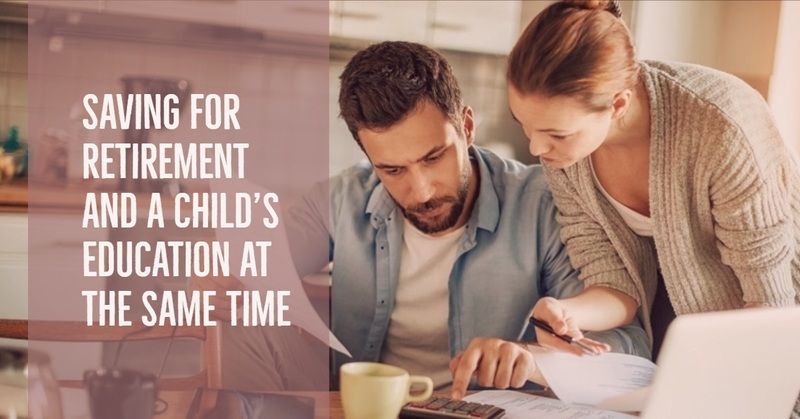 But if you wait until your child is in college to start saving, you'll miss out on years of potential tax-deferred growth and compounding of your money. Remember, your child can always attend college by taking out loans (or maybe even with scholarships), but there's no such thing as a retirement loan! If you're unsure about how to allocate your funds between retirement and college, a professional financial planner may be able to help. This person can also help you select appropriate investments for each goal. Remember, just because you're pursuing both goals at the same time doesn't necessarily mean that the same investments will be suitable. It may be appropriate to treat each goal independently. Defer retirement: The longer you work, the more money you'll earn and the later you'll need to dip into your retirement savings. Reduce your standard of living now or in retirement: You might be able to adjust your spending habits now in order to have money later. Or, you may want to consider cutting back in retirement. Increase your earnings now: You might consider increasing your hours at your current job, finding another job with better pay, taking a second job, or having a previously stay-at-home spouse return to the workforce. Invest more aggressively: If you have several years until retirement or college, you might be able to earn more money by investing more aggressively (but remember that aggressive investments mean a greater risk of loss). Note that no investment strategy can guarantee success. Expect your child to contribute more money to college: Despite your best efforts, your child may need to take out student loans or work part-time to earn money for college. Send your child to a less expensive school: You may have dreamed your child would follow in your footsteps and attend an Ivy League school. However, unless your child is awarded a scholarship, you may need to lower your expectations. Don't feel guilty — a lesser-known liberal arts college or a state university may provide your child with a similar quality education at a far lower cost. Think of other creative ways to reduce education costs: Your child could attend a local college and live at home to save on room and board, enroll in an accelerated program to graduate in three years instead for four, take advantage of a cooperative education where paid internships alternate with course work, or defer college for a year or two and work to earn money for college. Can retirement accounts be used to save for college?